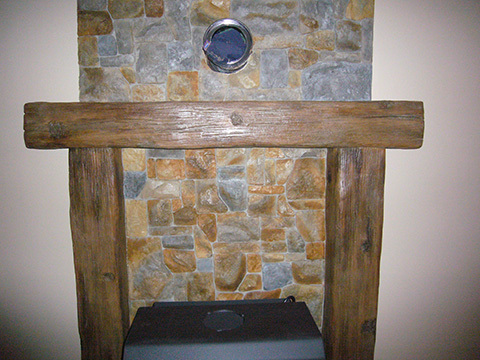 Vertical concrete is typically used to create a faux rock structure over a vertical substrate. The vertical concrete is placed over a prepared vertical substrate and then textured, stamped, and carved to mimic a realistic rock appearance. Finally, the concrete is stained and sealed for protection. Vertical concrete can be used on interior or exterior surfaces and is ideal for the client who wants to finish a basement or place a stone façade on their home. It is much cheaper than real stone masonry, and requires artistic capabilities to complete. In addition to vertical concrete, we can also create artificial rock work for yards and landscaping upon request.